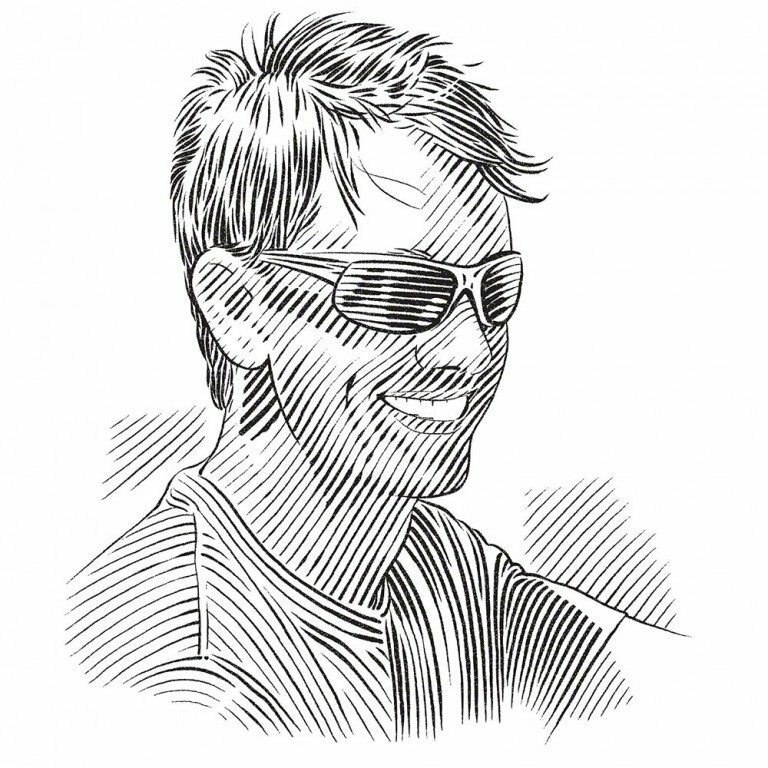 Fisheries come in a number of different guises, but tagging along with virtually all of them is a simple word with portentous significance: by-catch. Dr Dean Grubbs weighs up the world’s fisheries and explains why some are better for elasmobranchs than others. A fisherman's hands show only a few shrimp caught after an hour of towing his net, but many kilos of by-catch. By-catch is one of the most difficult issues to overcome in fisheries management. In simple terms, it is the capture of animals that are not part of the targeted or desired catch. Often these animals are not marketed but are discarded at sea, either alive or dead. In many fisheries, by-catch at some level is unavoidable and sometimes it may even be sustainable: for example, if the by-catch rate is negligible, if the by-catch species reproduce and replace themselves at a faster rate than the targeted catch, or if most of the by-catch is released alive and subsequently survives. A simple metric often used to evaluate how ‘clean’ a fishery is in terms of by-catch is the ratio of discards to landings. In a perfectly clean fishery, only targeted species of marketable size would be captured and this ratio would be 0 since there are no discards. Purse-seine fisheries that target small schooling fishes such as anchovies and menhaden tend to be the cleanest fisheries. Targeted species often make up about 99% of the catch (a discard-to-landings ratio of 0.01) because they are found in massive single-species schools. However, it is important to realise that these are among the largest fisheries in the world, so even a small proportion of by-catch can add up to millions of metric tons of discards on a global scale. It is also important to recognise that purse-seine fisheries may have other ecological consequences, since they target the forage base (the food species for other species) for larger fishes, including sharks. At the other end of the by-catch spectrum, bottom trawls for shrimp and demersal (bottom-associated) fishes are typically the ‘dirtiest’ fisheries. For example, the dead discards in shrimp trawl fisheries are usually larger, sometimes much larger, than the targeted catch. It has been estimated that in the Gulf of Mexico between five and 10 kilograms (11 and 22 pounds) of by-caught fish, crabs and other animals are discarded for every single kilogram (2.2 pounds) of shrimp. By-catch is especially problematic when the incidentally caught species has a life history that is much more conservative than that of the targeted catch; in other words, it matures later and reproduces more slowly. If the targeted species matures quickly and can double its population in one or two years, even a small by-catch of a long-lived species that requires more than a decade to double its population may be unsustainable. An endangered or charismatic species, such as a marine mammal or sea turtle, being taken as by-catch often elicits an emotional response from the general public. Of greater concern, though, is the fact that these species are often long-lived and reproduce slowly, so their populations do not rebound quickly after they have been depleted. For example, sawfishes (Pristidae) are considered to be the most imperilled of all chondrichthyans (sharks, rays and chimaeras). All five sawfish species are Endangered or Critically Endangered on the IUCN Red List of Threatened Species; in the USA, the smalltooth sawfish was the first native marine fish to be listed as Endangered under the US Endangered Species Act. Yet even though this species is thus fully protected in US waters, it is caught incidentally in shrimp trawls – and this fishery is believed to be the main reason for smalltooth sawfish mortality. Whereas the targeted shrimp mature in less than a year and produce hundreds of thousands of offspring – thus replacing themselves many times in one year – the smalltooth sawfish takes about 10 years to mature and produces about 10 offspring probably every other year, which means that only 10–15% of the popuulation is replaced each year. Such disparate life histories of targeted and by-catch species within a fishery are a recipe for trouble. The equipment fisheries use to catch fish can be divided into two broad categories: active gear, which physically moves through the marine environment and is capable of catching animals regardless of their behaviour; and passive gear, which requires the quarry to come to it. Active gear includes purse- and haul-seine nets that encircle schools of fish; mid-water trawl nets that are dragged through the water column and essentially filter out the animals in it; and bottom-trawl nets and dredges that scrape animals off the sea floor, often causing significant damage to the habitat. Passive gear may either attract fish, often with bait, or simply catch fish that pass by. In the first category are included a baited hook on a line and baited pelagic and bottom long-lines, as well as traps that attract fish by providing food or refuge. Nets are the other form of passive gear and they include gill, pound and fyke nets. Gill nets may be set on the bottom or in mid-water and may be anchored or drifting. On a global scale, purse-seine and trawl fisheries yield far more marine produce than all other types of fishing gear combined. Rates of by-catch, which includes sharks and other elasmobranchs, vary dramatically between these fisheries; even small operations can be of concern in some circumstances. There are four major fishery types – trawling, gill-netting, long-lining and purse-seining – and each involves elasmobranch by-catch in different ways. Trawls are large, funnel-shaped nets that are towed behind one or two fishing vessels. A combination of large ‘doors’ on bridles at the sides of the net, weights on the bottom and floats at the top keeps the net open. Caught animals are filtered down to a cod-end that is dumped when the net is hauled aboard. Pelagic, or mid-water, trawl nets target the likes of squid, herring and pollock and typically have low by-catch rates because these species often travel in single-species schools. In addition, the nets make no contact with the sea floor so there is little damage to marine habitats. Fisheries such as mid-water trawling for Alaskan pollock are therefore considered to be among the cleanest in the world. By-catch can become a concern, however, if the fishery also catches predators with vulnerable life histories that are feeding on the target species. For example, pelagic trawl fisheries for herring occasionally catch the marine mammals eating the small, silvery fish. Similarly, fisheries targeting pelagic squid may inadvertently take the molluscs’ predators, such as crocodile sharks or sharpnose sevengill sharks. Purse-seine fishing for salmon in Clayoquot Sound, Vancouver Island, British Columbia, Canada. In contrast to the pelagic type, bottom-trawl fisheries are among the dirtiest and most damaging. The net either drags or rolls along the sea floor, scraping up any animals that can’t out-swim it or squeeze underneath it. It often causes significant damage to marine habitats, from sea-grass beds in coastal zones to deep-sea corals. In most, perhaps all, bottom-trawl fisheries the by-catch exceeds the targeted catch; in some cases its biomass is more than 10 times that of the targeted catch. In the USA it has been estimated that nearly three-quarters of all fishery discards come from bottom-trawl fisheries. In general terms, these fisheries come in three categories, depending on their target: crustaceans such as penaeid and rock shrimp; ground fish such as flounder, cod and pollock; and deep-sea species such as grenadiers, scorpionfishes and beryciformes like orange roughy, alfonsino and redfish. By-catch of sharks and rays can be significant in all these categories and since the trawls can last from one to many hours, mortality is often nearly 100%. As an example, shrimp trawl fisheries in the USA have the highest discard-to-landings ratios and by some estimates are responsible for nearly 50% of all US fishery discards. The discards include a wide array of species, from small fishes and crustaceans to sharks and sea turtles. Recent stock assessments for small coastal sharks such as bonnethead, Atlantic sharpnose and blacknose show that total fishing mortality is dominated by by-catch discards in shrimp trawl fisheries. A thresher shark is fatally caught in a fishing net. Bottom-trawl fisheries targeting ground fish often include significant by-catch of skates and demersal sharks, whose local and regional populations can be quickly depleted. Angel sharks (Squatinidae) and guitarfishes (Rhinobatidae) are among the most threatened of all elasmobranch families and in many regions, such as the north-eastern Atlantic and the Mediterranean, by-catch in bottom-trawl fisheries is the main reason for the decline in their populations. Other bottom-trawl fisheries specifically target certain elasmobranch species and may inadvertently catch others. In the north-eastern USA, for example, two species of skate are targeted by a large fishery for their ‘wings’ and for bait, while five other species are taken as by-catch. These seven species vary in their abundance and life history and their capture can lead to declines in the ones that are more vulnerable. The population of at least one species, the thorny skate, has become severely depleted by this fishery. Deep-sea bottom-trawl fisheries can also take significant numbers of elasmobranchs, particularly squaliform sharks and catsharks (Scyliorhinidae), as by-catch. Squaliform sharks are often not discarded but kept for their meat and oil-rich livers, and regional popu-lations can quickly be depleted. Off the coast of New South Wales, Australia, deep-sea fisheries were reported to have caused severe population reductions in a suite of gulper sharks and dogfishes, as well as sawsharks, angel sharks and sevengill sharks. It is important to recognise that whereas some shark and ray species caught by trawl fisheries may be able to withstand high levels of by-catch mortality and rebound relatively quickly when by-catch levels decrease, other species are much more vulnerable and their populations may require decades to recover. At one end of the spectrum, although the Atlantic sharpnose shark suffers very high by-catch mortality in US trawl fisheries, the population remains stable because the species matures quickly (three years) and has a high reproduction rate. The barndoor skate in the north-western Atlantic has been shown to rebound in less than 10 years due to its high fecundity (approximately 50 eggs per year) in comparison to most elasmobranchs. By contrast, deep-sea squaliform sharks have some of the most conservative and vulnerable life histories. The data suggest that some gulper sharks take more than 30 years to mature and produce very few offspring (generally 1–4) following a gestation period of two years or more. As a result, it takes at least 50 years for a population to double. These sharks therefore are extremely vulnerable to by-catch overfishing and will take many decades to rebound if their populations are depleted. There has been little research into how the by-catch of sharks in trawl nets can be reduced. Although methods to reduce sea turtle by-catch have been developed successfully – and may also be moderately effective for large batoids such as stingrays – it is unlikely that they could be modified for small coastal and deep-sea sharks. In the case of the former, the effect of limiting tow time on post-release survival should be explored. However, restrictions on the type of trawling gear used and the closure of specific areas to trawling may be the only viable mechanisms for reducing elasmobranch by-catch. Gill nets rely on fishes swimming into them and getting entangled and since they can catch anything larger than the size of the mesh, their rates of by-catch are very high. The size of the mesh varies depending on the size of the targeted catch, in theory allowing smaller fish to pass through it. By-catch rates therefore tend to be higher for nets with smaller mesh. As in the case of bottom-trawl fisheries, the by-catch in gill nets comprises a wide variety of species; some researchers estimate that globally gill nets are responsible for more by-catch mortality of marine mammals, sea turtles and sharks than any other gear. High-seas drift gill-net fisheries such as those for flying squid and salmon in the North Pacific have been criticised for their extremely high rates of marine mammal and seabird by-catch, but their rates for shark by-catch are no less extreme. It has been estimated that approximately two million sharks, primarily blue and salmon sharks, were caught in the squid drift-net fishery in the North Pacific in 1990 alone. Gill-net fisheries for coastal fishes such as drums (Sciaenidae) and mullets (Mugilidiae) and coastal pelagic species like mackerels (Scombridae) often also catch large numbers of stingrays and small coastal sharks such as sharpnose and smooth-hound, as well as juveniles of large coastal species like blacktip and bull sharks. 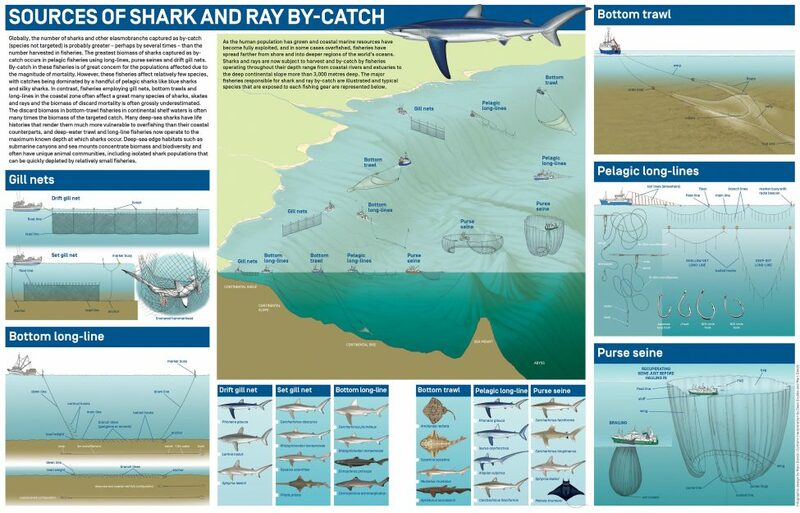 A recent analysis of by-catch in the drift gill nets (targeting Spanish mackerel) and sink gill nets (targeting drums and Spanish mackerel) along the south-eastern coast of the USA found that more than 20 species of sharks and rays were caught, including prohibited species such as Atlantic angel, dusky and sandbar sharks and manta ray. Although most elasmobranchs taken as by-catch are reported as discarded alive, post-release survival is very variable. It may be quite high for some stingrays, but is very low for many sharks. Despite aggressive management of the targeted long-line fishery for sharks in this region, species such as sandbar and dusky sharks have failed to recover fully from overfishing, probably because juveniles are being taken as by-catch in gill-net fisheries. A ban on the use of gill nets, particularly in locations where there are vulnerable species or life stages, is clearly the most straightforward way to reduce by-catch. The mortality of juvenile smalltooth sawfishes in gill-net fisheries for mullet in Florida waters is thought to have been a major contributor to the decline in this population of the Critically Endangered species. Following the ban on gill-net fisheries in Florida more than 20 years ago, researchers are now reporting signs that the smalltooth sawfish population is beginning to recover. However, gill nets are used extensively by artisanal fishers in developing nations because they are easy to deploy and retrieve from small boats. This being so, it is not feasible to ban them outright. Yet by-catch even at an artisanal scale can have major conservation implications for species that are endemic or have small regional distributions, such as river sharks (Glyphis spp.) and freshwater rays. Research into the effects of soak time and the size and break strength of gill-net mesh on shark by-catch rates and post-release survival is therefore badly needed. A stingray is fatally caught in a gill net. Long-lines are an effective fishing gear that can be employed across various habitats from rivers (where gear such as catfish trotlines may be used) to shallow coastal waters, the open ocean and the deep sea. Unlike trawl and gill nets, long-lines are selective for species that can be lured to take a baited hook, which include most predatory fishes. A long-line consists of a main line to which a series of branch lines (also called gangions or snoods) is attached. Each branch line terminates in a baited hook. The main line may be any length and contain any number of hooks, but generally it ranges from hundreds of metres long with only 20 or so hooks in some near-shore and deep-sea fisheries to more than 100 kilometres (60 miles) long with over 1,000 hooks in pelagic fisheries. The branch lines may be clipped to the main line during each deployment or sewn permanently into the main line. Pelagic long-lines are not anchored, but are set adrift and marked with highfliers (floats with a radar reflector and possibly a radio transmitter) to locate the ends. They employ a combination of floats, weighted branch lines and varied branch line lengths to reach the depths of the targeted species. Bottom-set (demersal) long-lines are anchored at both ends and marked by a buoy at one or both ends. Whereas the branch lines for pelagic long-lines may be as much as 10–20 metres (32–64 feet) long, the branch lines for demersal long-lines generally range from only 20 centimetres (eight inches) to three metres (10 feet) long. Pelagic long-line fisheries are often seen in a negative light by environmental groups because of their by-catch, although they are relatively clean when compared to bottom-trawl and gill-net fisheries in terms of their discard-to-catch ratio. In US pelagic long-line fisheries, for example, only 3–15% of the catch is discarded. However, as in trawl fisheries, the disparate life histories of target and by-catch species are a concern in long-line fisheries. Whereas targeted pelagic fishes such as tunas and mahi mahi mature early and produce many offspring, resulting in population doubling times in the order of two years, the by-catch often comprises charismatic species such as pelagic sharks and sea turtles that have conservative life histories and population doubling times that may be much greater than those of the targeted species. Sharks are often the dominant by-catch in pelagic long-line fisheries. In the tuna fishery in the Western Tropical Pacific, shark by-catch has been shown to be relatively high – approximately one shark for every two tunas caught. However, a comparison of many pelagic long-line fisheries has suggested that shark by-catch rates were lowest in high-seas fisheries targeting tunas (such as those of Japan, Fiji and Hawaii) and highest in fisheries in shallower water and closer to shore (such as Chile’s mahi mahi and Hawaii and Chile’s swordfish fisheries). Although the number of individual sharks caught may be very large, relatively few shark species are affected by pelagic in comparison to bottom-trawl fisheries. 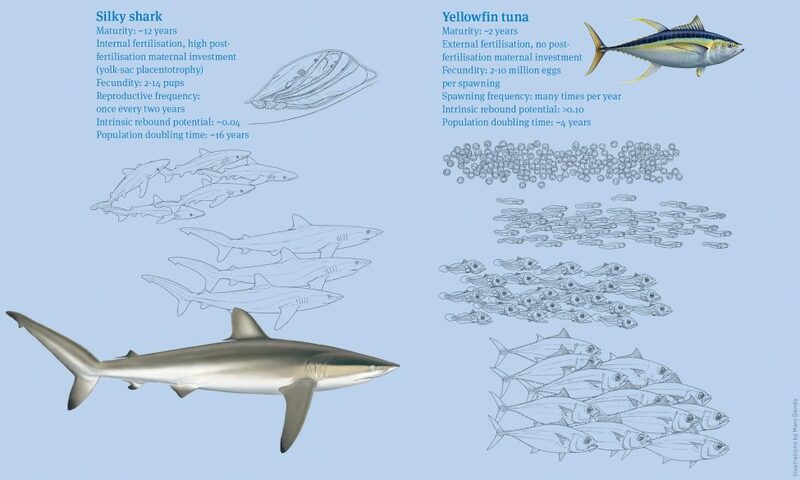 Globally, the blue shark is the dominant species caught in pelagic long-line fisheries, followed by the silky shark and the oceanic whitetip. The proportion of sharks taken as by-catch being kept and sold as opposed to being discarded at sea varies greatly from one fishery to the next, depending on regulations and the markets available. It has been shown that most of the sharks that end up in the international fin trade are by-catch in pelagic long-line fisheries and there is concern that, while the targeted stocks of pelagic bony fishes are harvested sustainably, these shark species may become depleted. In most pelagic long-line fisheries, the blue, silky and oceanic whitetip sharks are reported being discarded alive, but post-release mortality has not been estimated and may be high. Marketable species such as the shortfin mako and the three thresher sharks are typically kept to be sold and, given their conservative life histories, they are of great management concern. It is also important to recognise that some pelagic fisheries retain all the sharks taken as by-catch. For example, the swordfish fishery off Uruguay, which has an extremely high rate of shark by-catch, typically markets more than 95% of the blue sharks caught. Several mitigation measures to reduce shark by-catch on pelagic long-lines have been assessed, though their effectiveness often depends on the species involved. The use of monofilament instead of steel leaders and of squid bait instead of fish bait has been shown to reduce the number of sharks caught, with relatively little – or even a positive – effect on the catch rate of the targeted tunas and swordfish. A bottom trawler scrapes the ocean floor, destroying the habitat. The depth of the hooks is often an important consideration. The majority of pelagic sharks, such as silky and oceanic whitetip, spend most of their time in the upper mixed layer shallower than 100 metres (330 feet). Increasing the depth of hooks to 100 or 150 metres (500 feet) has been shown to reduce by-catch rates significantly for these and most other shark species. However, blue, bigeye thresher and shortfin mako sharks make daily excursions to depths of 400 metres (1,320 feet) and more. For them, factoring in both time of day and depth when deploying hooks may reduce by-catch. More research needs to be undertaken to determine what influences shark by-catch rates in pelagic long-line fisheries so that additional mitigation measures can be identified. At-boat and post-release mortality rates for sharks caught on pelagic long-lines vary widely, depending on the species. Some sharks, such as the smooth, scalloped and great hammerheads and all the thresher sharks, often suffer at-boat mortality at a rate of at least 25% and sometimes more than 50%, and it is likely that most of the sharks released alive do not survive for long. In contrast, the at-boat mortality rate of blue, silky and oceanic whitetip sharks – the three species most often caught on pelagic long-lines – as well as of mako sharks, is only 5–20%, and the few data available suggest that post-release survival may be quite high. A large meta-analysis of tagged blue sharks caught on pelagic long-lines suggests that the species’ total mortality rate (at-boat and post-release) is less than 15%. Demersal, or bottom-set, long-lines are those whose hooks lie directly on the sea floor (as opposed to pelagic long-lines, whose hooks are suspended in the water column and the lines themselves drift with the current). Many targeted shark fisheries deploy demersal long-lines as their primary gear, but there are also a number of fisheries using the same gear for bony fishes that take significant shark by-catch. In fact, the by-catch on demersal long-lines can be 50% or more of the overall catch – a much higher overall by-catch rate than that of pelagic long-lines. In terms of species, it is likely that demersal long-line fisheries take more shark species as by-catch than do all other fisheries combined. In the Gulf of Mexico, the two most common by-catch species taken by the US demersal fishery for groupers are Cuban dogfish and blacknose shark. It is reported that more than 95% of these sharks are released alive, but a recent study has shown that about half of them would have soon died, even if they were released in a healthy condition. In addition, on some vessels the hook is ripped from the shark’s mouth, breaking the lower jaw, which probably increases the post-release mortality rate. The deepest fisheries in the world are demersal long-lining ones, such as those targeting Patagonian toothfish (down to 3,000 metres, or 9,840 feet) and Greenland halibut, grenadiers, hake and ling (2,000 metres, or 6,560 feet). Shark by-catch in these fisheries can be very high for species like Portuguese dogfish, lanternsharks, gulper sharks and their relatives, as well as for numerous species of catshark. Some of these species are kept and sold for their livers and meat, but most small sharks are discarded at sea. Mortality is probably 100% in these fisheries as not only are the sharks unable to survive being retrieved from great depth, but their jaws are broken on landing by the auto-line retrieval system that pulls the hooks through a set of steel rollers. Similarly, demersal long-lining fisheries targeting cusk-eels off Chile and hake off the coasts of numerous European and African countries have relatively high by-catch rates of deep-water catsharks, gulper sharks and dogfishes. The species caught in these deep-sea fisheries have some of the most conservative life histories and are therefore extremely vulnerable to by-catch overfishing. Generation times are measured in decades and recovery time for a population may take centuries if depletion is severe. Even in targeted shark fisheries that are reasonably well managed, by-catch is a major concern. The shark long-line fishery in US Atlantic waters targets large coastal sharks and is regarded as one of the best-managed fisheries of its kind in the world. However, more than half of its catch can be of small coastal sharks, such as the Atlantic sharpnose, that are not marketed – and most are discarded dead. Moreover, species that are prohibited because they are overfished (such as dusky or sandbar sharks) or endangered (smalltooth sawfish) are also taken as by-catch. Fortunately, many of these are quite resilient and probably survive capture. The largest fisheries in the world are purse-seine fisheries that target small pelagic fishes such as anchovies, herring and menhaden. Historically these fisheries have been relatively clean in terms of by-catch as they typically target dense single-species schools of fish. Industrialised fishing for larger pelagic fishes such as tunas has developed relatively recently – during the latter half of the 20th century – and now purse-seine nets are also responsible for catching more tunas than any other form of fishing. Three types of fishing gear are primarily used for harvesting tunas: bait boats with hand lines, pelagic long-lines and purse-seine nets. Globally, the three types resulted in similar tuna landings until the early 1980s, but since then purse-seine landings have increased nearly 10-fold whereas long-line and hand-line landings have remained relatively stable. Purse-seine fisheries are now responsible for about 70% of all tuna landings worldwide, although the pattern differs from one species to another. Most albacore tuna are still landed in long-line, hand-line and troll fisheries, but 75–90% of global skipjack, yellowfin and bigeye tunas are caught in purse-seine nets, which are also the dominant gear type used to harvest Atlantic bluefin tuna. Purse-seine nets are deployed in the open ocean over deep water. Those used for tunas are typically 1,000–2,000 metres (3,280–6,560 feet) long (about 300–650 metres, or 985–2,130 feet, in diameter) and usually at a depth of about 200 metres (650 feet). Very simply, the seine has a float line and a lead line and it is positioned to encircle a school of fish, with one or two boats pulling it from the larger harvest vessel. Once the float line circle is closed, the opening at the bottom of the net is closed, or pursed, by cinching the lead line and thus preventing any fish from escaping. The net volume is reduced and the catch is hauled aboard the harvest vessel, removed from the net and placed in the ship’s hold. Four methods are used to locate the tuna. Visual spotters on the vessels or in aircraft look for free schools of tuna feeding or swimming at the surface. This is the most challenging and least productive method, as free schools are constantly moving and difficult to locate and the tuna are more likely to be startled and dive deep before the net has been deployed. However, free schools tend to be dominated by the targeted tuna species and there is therefore very little by-catch. Tunas are often not close enough to the surface to be spotted, but they are known to associate with other species – primarily dolphins, but also whales and whale sharks – that do spend more time at the surface. In the Eastern Pacific, if a large pod of feeding dolphins is located, there is often a substantial school of yellowfin tuna below it – an association that is far less common in other parts of the world. By-catch in dolphin-associated purse-seine fisheries is mainly silky sharks, but rates are quite low. Floating objects that drift around oceanic gyres (sometimes for years) tend to attract and hold large communities of organisms that seek refuge in the dangerous open ocean. These objects may be natural, such as trees or logs that have been swept into the sea from rivers, or man-made, like lost fishing nets or pieces of wrecked vessels. According to one study, more than 300 fish species are associated with such refuges in the open ocean. Pelagic predators such as tunas and sharks in turn are attracted to these floating objects and the potential prey they harbour. Many tons of pelagic fishes may aggregate at a relatively small floating object and, not surprisingly, by-catch rates on floating-object sets are much higher than on free-school or dolphin-associated sets. The most vulnerable component of this by-catch is pelagic sharks. The fourth method to locate tunas is a variation on the floating object theme. Fishers exploit the tendency for tunas to gather at floating objects by deploying purpose-built fish aggregating devices (FADs) to attract them. These FADs may be floating or anchored and as simple as palm fronds tied together or as complex as large structures with radio or satellite locator beacons and integrated sonars that enable fishers to estimate the biomass of aggregated fish. FADs attract diverse communities of animals and the by-catch rates of the associated fishery are therefore very high. Pelagic sharks, big and small pelagic fishes and large amounts of undersize tuna discards make up most of the by-catch. The evolution of tuna purse-seine fisheries in the Eastern Tropical Pacific with their associated by-catch issues is an interesting case study in the complexities of fisheries management – and perhaps in the effects of well-meaning but misguided environmental activism. This was the subject of many years of research by Dr Martin Hall of the Inter-American Tropical Tuna Commission. The targeting of dolphin-associated tunas became an environmental issue in the late 1960s that generated significant controversy due to the high rate of dolphin mortality and estimates of rapidly declining dolphin populations. However, by the late 1980s dolphin mortality began to decrease dramatically after the fishery developed its own technique – called a ‘backdown’ – to reduce dolphin by-catch. After encircling a pod of dolphins and the associated tunas, the fishers would reverse their vessel and pull the back of the net, submerging the floats and allowing the dolphins to escape before being hauled into the net. Although dolphin mortality was already in a steep decline, the ‘dolphin-safe’ tuna labelling campaign was launched by the Earth Island Institute. This led US canneries to adopt dolphin-safe policies in 1990, which required them to buy only tunas that had been caught by methods that did not involve encircling dolphins. The labelling campaign led to only a modest reduction in the number of dolphin sets made in the Eastern Pacific and by the late 1990s the amount of fishing effort associated with dolphin pods was back to pre-1990 levels and the tuna was being sold to countries other than the USA. Yet by 1993 dolphin mortality had decreased to almost zero, thanks to the procedures developed by the fishery prior to dolphin-safe labelling, and it has remained extremely low for more than 20 years. In an unintended consequence, however, dolphin-safe labelling led the US purse-seine fleets to develop the use of FADs. In the Eastern Pacific, as recently as 1989 95% of the floating objects used by the purse-seine fishery were natural; by 1995 more than 80% were FADs and by 2009 the proportion had risen to 95%. By-catch in purse-seine fisheries in this region between 1993 and 2009 was estimated to be only 0.5% of the catch in dolphin sets but nearly 10% of the catch in FAD sets – a 20-fold difference. This annual by-catch was calculated to include nearly 3,500 sharks in dolphin sets but more than 35,000 sharks in FAD sets. It was estimated that the capture of one single dolphin in dolphin-associated purse-seine nets was equal to the by-catch of approximately 25 sharks and more than 900 fishes in FAD-associated purse seines. The success of using fisherman-deployed FADs to catch tunas in the Eastern Pacific in the early 1990s led to the rapid expansion of their use in all tropical oceanic regions. FAD-associated purse-seine fisheries now account for more than half the global landings of tuna. It is widely recognised that of the diverse species that are taken as by-catch in FAD-associated tuna fisheries, sharks are the most vulnerable because of their life histories. In some regions, more than 20 shark species are caught in purse-seine nets. And of these sharks, silky and oceanic whitetip sharks dominate worldwide, followed at some distance by scalloped and smooth hammerheads. The magnitude of the purse-seine fishing effort globally puts these species at risk and significant population decreases have been documented in some regions. In most purse-seine tuna fisheries, it is required that any sharks caught have to be released alive. However, the sharks caught in these fisheries are mostly pelagic and, as obligate ram ventilators, they must swim constantly so that sufficient water passes over their gills to oxygenate them. These sharks therefore tend to be quite fragile and soon die if they aren’t actively swimming. For this reason, whereas pelagic sharks caught on long-lines have a relatively high survival rate, the rate for sharks taken by purse-seine fisheries is likely to be very low. Two recent studies examined post-release mortality in silky sharks caught in tuna purse-seine nets set around FADs in the Pacific Ocean. In both studies it was found that most silky sharks were dead when landed and the majority of those released alive subsequently died. The total mortality for silky sharks caught in purse-seine nets was estimated to be 80–95% in one study and at least 84% in the other. One study also reported that 100% of scalloped hammerheads taken in purse-seine nets died after being released. The problem of by-catch in purse-seine fisheries using drifting FADs is compounded by the fact that the structure of the device itself causes additional mortality. In many drifting FADs, old fishing net hangs down from the structure and marine life, including sea turtles and sharks, becomes entangled in it. These deaths are not included in fishery by-catch estimates, but they can be substantial. A recent study conducted in the Indian Ocean estimated that the mortality of silky sharks entangled in FADs may be five to 10 times the actual by-catch in the associated purse-seine fishery. By-catch and how to reduce it is one of the most difficult and complex issues faced by fisheries managers. Relatively few fisheries exist where by-catch is not a major concern, and it is particularly troubling when it includes elasmobranchs whose life histories are more conservative than those of the targeted catch, making them more vulnerable to overfishing. To truly be sustainable, fisheries should be managed for the sustainability of the most vulnerable species caught, even if those species are by-catch with no economic value. This rarely happens, however, because fisheries are important to economies and the demand for seafood is high. It is important for consumers to understand that the real cost of seafood often goes well beyond the monetary cost of the product.